Hi there! Today’s post deals with the early evolution of Mercury, in particular its cooling. At the beginning of its life, a planet experiences variations of temperature, and then cooling, and while cooling, it contracts. The surface may present some signature of this contraction, and this is the object of the paper I present you today. It is entitled Timing and rate of global contraction of Mercury, by Kelsey T. Crane and Christian Klimczak, from the University of Georgia, and it has been recently accepted for publication in Geophysical Research Letters. The idea is to infer the history of the contraction from the observation of the craters and the faults. Mercury is the innermost planet of the Solar System, with a mean distance to the Sun which is about one third of the Sun-Earth distance. It has an eccentric orbit, with an eccentricity of 0.206, and orbits the Sun in 88 days while the planet rotates around itself in 58 days. This is very long when compared to the terrestrial day, but it also means that there is a ratio 1.5 between the spin and the orbital frequencies. This is called a 3:2 spin-orbit resonance, which is a dynamical equilibrium favored by the proximity of the Sun and the orbital eccentricity. An interesting fact is the high density of Mercury, i.e. Mercury is too dense for a terrestrial planet. Usually, a large enough body is expected to have a stratified structure, in which the heaviest elements are concentrated in the core. 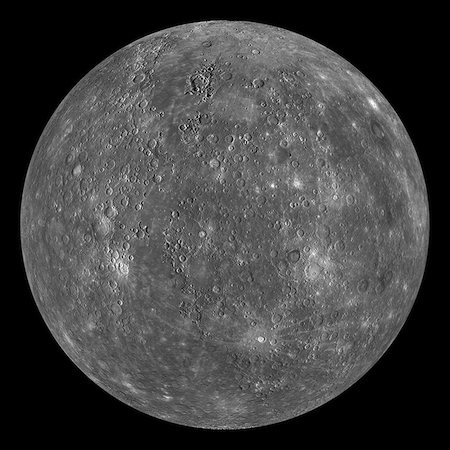 Mercury is so dense than it is thought to be the core of a former and larger proto-Mercury. The scenario of the large impact was very popular until the arrival of MESSENGER, in particular because the models of formation of the Solar System and the observation of the surface of Mercury suggest that Mercury has been heavily impacted in its early life. However, the detection of volatiles elements, in particular potassium, on the surface of Mercury, is interpreted by some planetary scientists as inconsistent with the large impact scenario. The large impact would have induced extreme heating of the planet, and for some scientists the potassium would not have survived this episode. The other scenarios involve much slower processes, and less heating. This raises the question: how hot was the early Mercury? We still do not know, but this is related to the study I present here. The proximity of Mercury to the Sun makes it difficult to explore, because of the large gravitational action of the Sun which significantly perturbs the orbit of a spacecraft, and more importantly because of the large temperatures in this area of the Solar System. Mariner 10 (NASA): It has been launched in November 1973 to make flybys of Venus and Mercury. Three flybys of Mercury have been realized between March 1974 and March 1975. This mission gave us the first images of the surface of the planet, covering some 45% of it. It also discovered the magnetic field of Mercury. MESSENGER (Mercury Surface, Space Environment, Geochemistry, and Ranging) (NASA): This was the first human-made object to orbit Mercury. It was launched in August 2004 from Cape Canaveral and has been inserted around Mercury in March 2011, after one flyby of the Earth, two flybys of Venus, and three flybys of Mercury. These flybys permitted to use the gravity of the planets to reduce the velocity of the spacecraft, which was necessary for the orbital insertion. 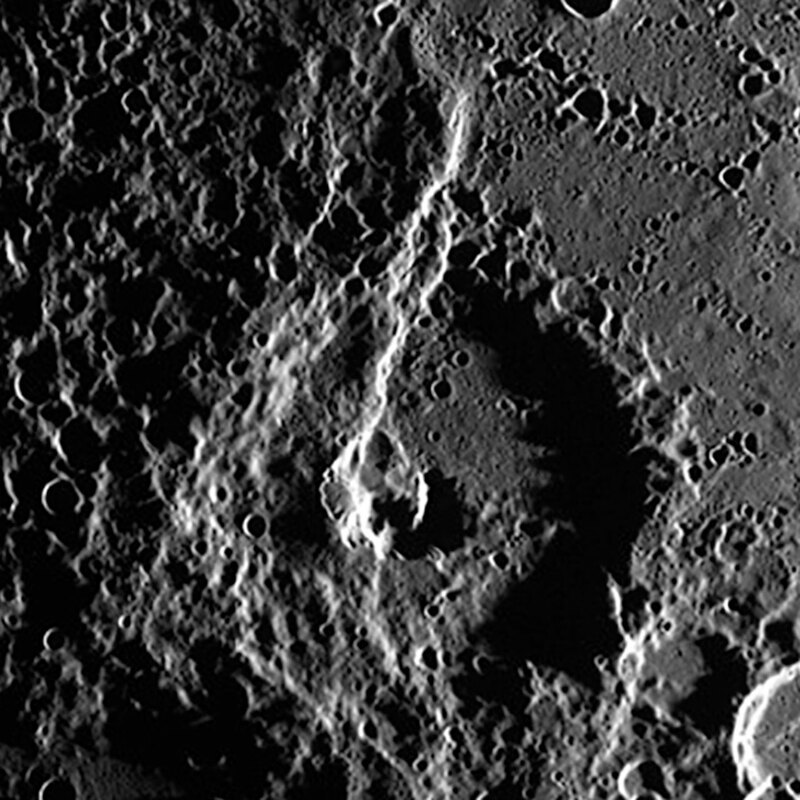 MESSENGER gave us invaluable data, like the gravity field of Mercury, a complete cartography with topographical features (craters, plains, faults,…), new information on the gravity field, it supplemented Earth-based radar measurements of the rotation, it revealed the chemical composition of the surface… The mission stopped in April 2015. Bepi-Colombo (ESA / JAXA): This is a joint mission of the European and Japanese space agencies, which is composed of two elements: the Mercury Magnetospheric Orbiter (MMO, JAXA), and the Mercury Planetary Orbiter (MPO, ESA). It should be launched in October 2018 and inserted into orbit in December 2025, after one flyby of the Earth, two flybys of Venus, and 6 flybys of Mercury. Beside the acquisition of new data on the planet with a better accuracy than MESSENGER, it will also perform a test of the theory of the general relativity, in giving new measurements of the post-newtonian parameters β and γ. β is associated with the non-linearities of the gravity field, while γ is related with the curvature of the spacetime. In the theory of the general relativity, these two parameters should be strictly equal to 1. Tides, which is a much slower process that creates faults, appearing while the planet is contracting. The local stress tensor can be inferred from the direction of the faults. the crater interrupts the fault. In the first case, the fault appeared after the impact, while in the second case, the fault was already present before Mercury was impacted. So, if you can constrain the age of the crater, you can constrain the apparition of the fault, and the contraction of the planet. From a global analysis of the age of the faults, the authors deduced the variation of the contraction rate over the ages. The authors used a database of 3,112 craters ranging from 20 to 2,000 km, which were classified into 5 classes, depending on their degree of preservation. And the result are given below. This means that the contraction rate has decreased over the ages, which is not surprising, since the temperature of Mercury has slowly reached an equilibrium. In my opinion, such a study could permit to constrain the evolution of the temperature of Mercury over the ages, and thus date its stratification. Maybe this would also give new clues on the way Mercury lost its light elements (impact or not?). The study, with a video presentation. The web page of Kelsey Crane. The web page of Christian Klimczak.